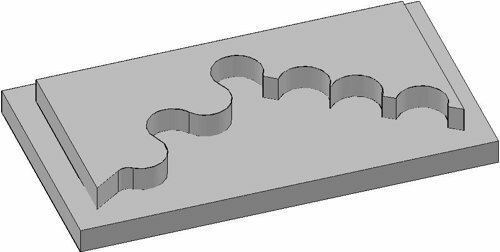 This is a series of articles for cnc machinists/programmers to explain the Concepts and Programming methods of Circular Interpolation. No doubt every component in cnc machining workshop have somekind of Arc, Radius, Circle, So it is not only necessary but a must to learn how to program those arcs, radius, circles and also to learn the basic concepts, fundamentals of circle and circular interpolation. So in short we have just stated a series of articles/tutorials to ease this job for cnc machinists/cnc programmers and for cnc novices who just have started taking cnc classes. A translation of linear axis positions into curved tool motions is called circular interpolation. Another definition is “Circular Interpolation commands are used to move a tool along a circular arc to the commanded end position”. Circular interpolation requires five pieces of information’s; an endpoint, a feed rate, a center, a radius, and a direction of movement. Circular interpolation is a motion of tool in circle. It may be a complete circle or less than. Before going to discuss five pieces of information for circular interpolation, first it is very important to understand the elements of circle in detail. A circle is defined as a closed curve on a plane, where all points have the same distance from an internal point called the circle center point. The radius of a circle is the line segment from the center point to any point on the circle. The diameter of a circle is the line segment through the center point of the circle and having both end points on the circle. A quadrant is any one of the four parts of the plane formed by the system of rectangular coordinates. 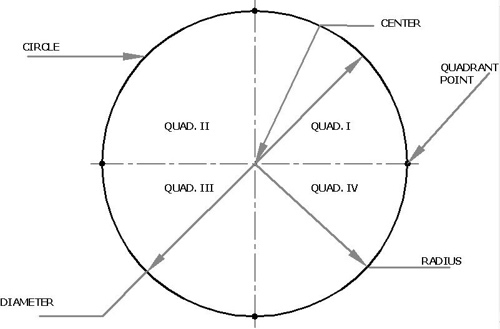 It is to every programmer’s benefit to understand the concept of quadrants and their application for circular motions in milling and turning programs. A circle is programmed in all four quadrants, due to its nature, while most arcs are programmed within one or two quadrants. When programming the arc vectors I, J, and K, the angular difference between the arc start and end points is irrelevant. The only purpose of arc vectors is to define a unique arc radius between two points.